I’have taken over the domain screenfreeze.net due to Andreas Wilhelm’ sudden death which came unexpected. I would like to thank him for his work and emphasize, that all content under this domain has been published by him, Andreas Wilhelm, also if I have changed the author mapping of the article objects because of technical reasons. My condolence to his family! The DeskCon Project makes use of the OpenSSL Libraries on Linux and Android. That means that a Heartsbleed Attack is possible, at least at the Desktop side. Most Android Versions do not have the “Heartbeat” Feature enabled (only Android 4.1.1) so most are save, but to be sure you can use this App to test your Device. This has been fixed in OpenSSL 1.0.1g. Please update your OpenSSL Package! I created a Launchpad PPA Repository for the Desktop Packages of DeskCon. This Repo is for usage with Ubuntu Quantal, Saucy and Trusty. 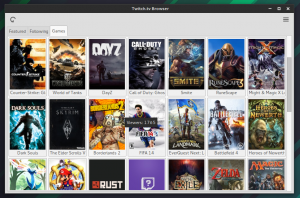 This is just a little Side Project, a Desktop Application that lets you browse through Twitch.tv Streams, Channels and open them in your Video Player (VLC, MPlayer, MPV, …). No need for a CPU heavy Flash Plugin. For now it’s for Linux only, but given it is written in Python, a Port to other Systems shouldn’t be difficult. You can get the latest from here. Sometimes i like to watch a Stream on Twitch or Justin.tv, but the Flashplayer is always acting up, stutters and eats my CPU. Then I came across Livestreamer, which is a Commandline Program. And to avoid typing the specific Terminal Command over and over, I developed this GUI Software. Now I will focus more on DeskCon again. On the 15th of January 2014 our Domain “screenfreeze.net” and Webspace will move to a different Registrar. Some downtime is to be expected, just use this address http://www.screenfreeze.de/ instead. First of all, I’m not a Security Expert, I just use the well known Encryption and Security standards. So if you find any flaws in how I implemented that stuff, please tell me. Basically I use self-signed Certificates with a TLSv1.2 SSL Connection. During the “pair”-Process, Desktop and mobile Device exchange their X509v3 Certificate and print out the Fingerprints (sha256), so that the User can verify their Identity. If the User says they match, the Certificates will be stored. The Certificates are generated from a 2048-bit RSA Key-pair and signed with SHA256 Algorithm. The SSL Connection is actually over TLSv1,TLSv1.1 or TLSv1.2 depending on your Android Version (TLSv1.2 is supported in Android 4.1 and up) and the OpenSSL Library Version. Server and Client have to authenticate each other with the mentioned Certificates. So the whole data Transfer is encrypted and the Devices (Desktop and MID) can be sure they talk with the right Machine.